A few months ago, a friend of mine on Facebook posted that they were making this dish for dinner one night. I immediately headed on over to Pinterest and searched stalked her boards until I found the recipe. Still, it sat all alone and neglected on my own ‘to try’ board for quite some time. I’d almost completely forgotten about it. Lucky for me, I was totally un-inspired for dinner a few weeks ago and went through all 1,283 pins on that board looking for a recipe spoke to me. This didn’t speak so much as shout, ‘EAT ME,’ at me. Simple, totally indulgent, delicious. You need this in your life. 1. Place chicken, broth, ¼ cup buffalo sauce, and seasonings into the crockpot. 2. Top with cream cheese and shredded cheese. 3. Cover and cook on high for 4 hours or low for 8. 4. When chicken is fully cooked remove to separate bowl and shred. 5. Add remaining ¼ cup buffalo sauce to chicken and toss to coat. 6. Set aside the shredded chicken. 7. Whisk together corn starch and water and add to crock. 8. Use a whisk and stir until cheese and cream cheese is all combined and smooth. 9. Break noodles in half and place in crock. 10. Top with chicken and cover. 11. Turn crock on high for 30-60 minutes, stirring occasionally so the noodles don’t stick together, until noodles are fully cooked. One dish meals are a favorite of mine this time of year. There’s something so comforting about casseroles when the cooler weather strikes. 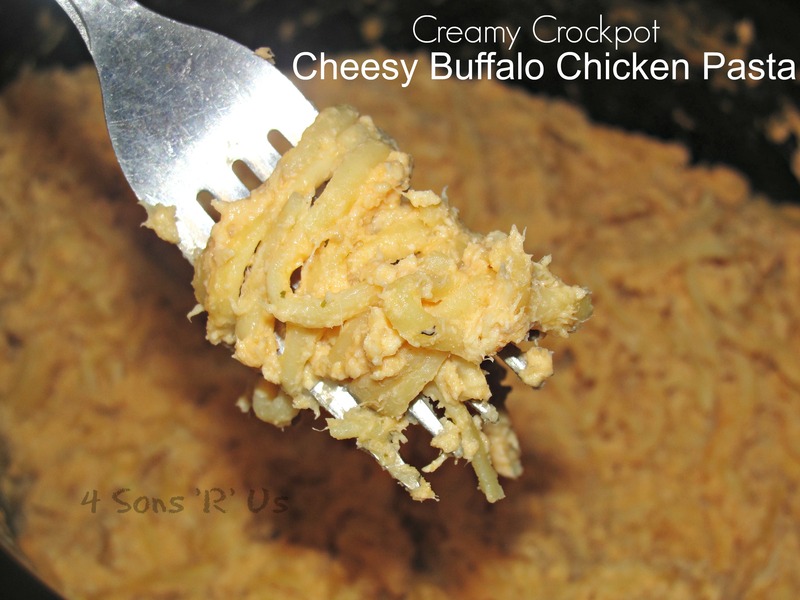 Delicious flavors in this one…quite reminiscent of the buffalo chicken dip my husband and daughter love so much. Thanks for bringing it along for the Fiesta Friday celebration! I didn’t even know you could make noodles in the crockpot! Your husband and sons are so lucky to have such a great cook. I loved their reactions to this dish! haha! This looks delicious, and a great meal for these cooler days!